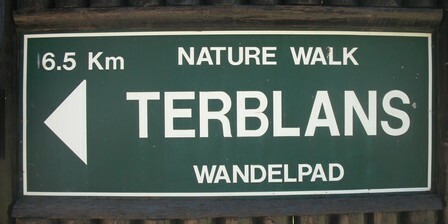 The Terblans Walk is an easy and beautiful walk through the indigenous Knysna forest. It starts and ends at the Grootdraai picnic site, ideal for a picnic before or after the hike. From the Grootdraai picnic site the trail heads in to the forest sharing the path with the Outeniqua overnight trail so be sure to keep right at the fork shortly after the start, follow the bush pig signs. 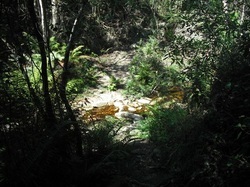 The path meanders through the forest and crosses some small forest streams. A little further there is another junction with the Outeniqua trail, keep to the right here as well. The trail comes to a gravel service road, turn right, the trail continues on the other side just a short distance down the road. Shortly after the road crossing the is a cement dam in the stream were you can take a refreshing swim. The trail later crosses a service road for the second time. Along this section the trail skirts the forest along a blue gum tree plantation and later a pine plantation. The trail walks out onto a service road for the 3rd time, turn right here again, this is Kom-se-pad. Walk along the road to were the path turns of to the left and heads back to the picnic site. The picnic site has beautiful picnic tables under the trees and there are toilets as well. On departing you can drive back the way you came, or you can continue with Kom-se-pad, it joins the R339 between Uniondale and Knysna. It is a beautiful round trip of about 60km from Knysna. 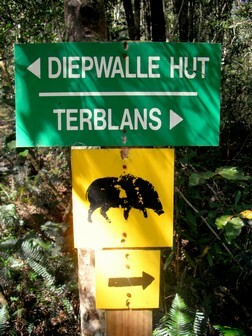 Route markers: The route follows the Outeniqua Hiking Trail in places, Terblans route markers are yellow plastic signs with a bushpig on. 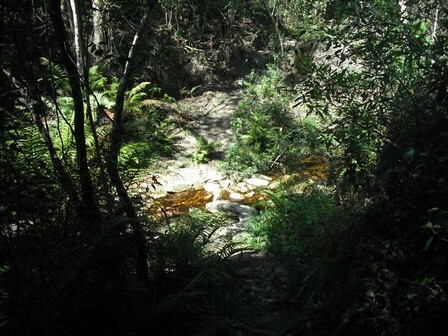 There are quite a couple of forest slip-paths in this area, dont mistake them for the trail. Permits/Costs: Self issue permit at the start. Directions: Head out of Knysna towards George, along the lagoon take the Old Cape Road turnoff to Gouna / Simola, follow this road past Simola. As the road becomes gravel take the Gouna turnoff to the left. Follow this road past the Gouna Forest Station to the Grootdraai Picnic site along Kom-se-pad. This picnic site can also be reached by taking the Kom-se-Pad turnof from the R339 near Diepwalle. 19KB. Only Garmin GPS units supported, need BaseCamp, MapSource or Trip & Waypoint Manger to open.